Explanation: As the Earth spins on its axis, the sky seems to rotate around us. 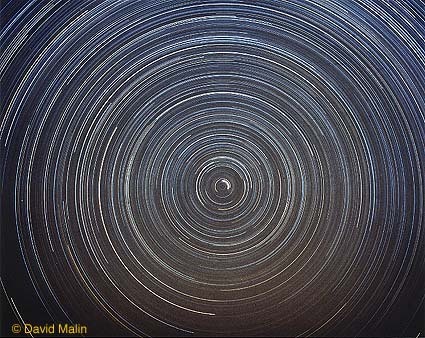 This motion produces the beautiful concentric arcs traced out by the stars in this time exposure of the night sky. In the middle of the picture is the North Celestial Pole (NCP), easily identified as the point in the sky at the center of all the star trail arcs. The very short bright trail near the NCP was made by the star Polaris, commonly known as the North Star.